Cruciferous veggies like cabbage offer a unique nutrient profile. Cabbage is a great vegetable for variety; it can be eaten cooked or raw, and comes in both red and green. 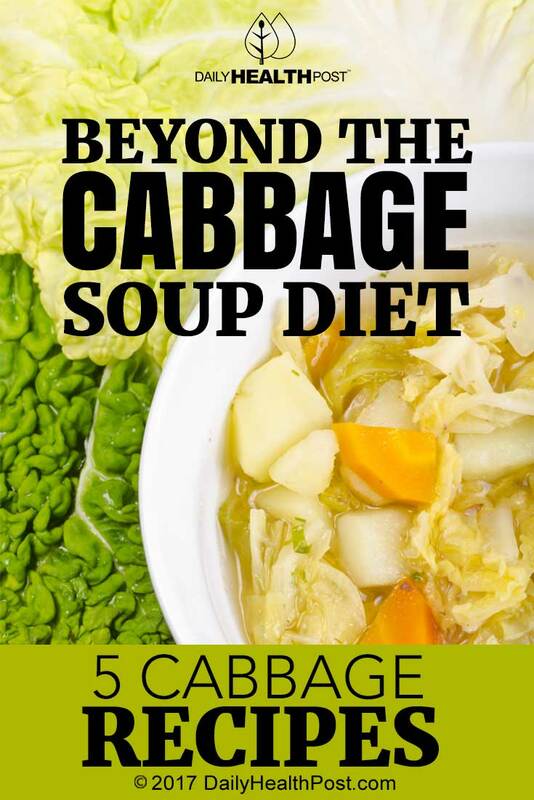 Cabbage is chock full of vitamins C and E, as well as calcium and potassium. And let’s not forget that cabbage is rich with fiber. For some delicious and nutritious ways to incorporate cabbage into your diet, read up on the following recipes. Fresh spring rolls are a delicious alternative to their deep-fried counterpart and make an excellent snack, appetizer, or light meal. 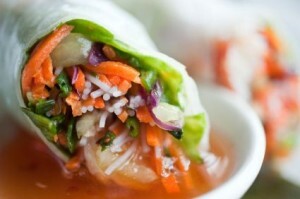 There are a variety of ways to prepare them, and this recipe for fresh spring rolls allows for a number of different options. It’s up to you to choose the sauce and fillings – it all depends on your own personal preference. This recipe recommends using fresh, raw vegetables for a satisfying crunch. Fresh spring rolls use rice paper wrappers, which soften by being submerged in a flat dish filled with hot water (try a pie pan). Fill them with the vegetables and, if you like, meat or cheese. Finally, fold and then slice in half. Cole slaw is traditionally made with primarily white or green cabbage – try red for a colorful change! 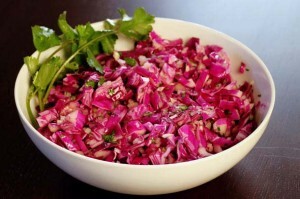 This recipe for red cabbage slaw is simple and delicious, a perfect summer side salad. Toss roughly cut red cabbage, carrots and onion with olive oil, vinegar and sugar, and then toss in some golden raisins. Let the dish sit for an hour before serving. Mashed potatoes are a family favorite, but have you ever heard of smashed potatoes? This recipe for smashed red potatoes with cabbage is sure to deliver. 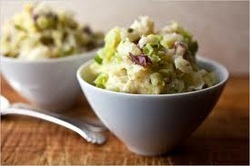 Irish colcannon is a traditional dish that blends mashed potatoes with cabbage and onions or scallions, and this dish takes a new spin by smashing the potatoes with their skins on and then mixing in chopped cabbage and scallions. For your own variation, try whatever spices tickle your taste buds! Stir fry is delicious, quick and easy to make. This recipe for tofu and cabbage stir fry uses a tangy peanut sauce with peanut butter, orange juice, soy sauce, vinegar and sugar. Add garlic for extra flavor in the sauce. Cook the tofu and chopped purple cabbage over medium high-heat in a wok or skillet with the sauce, and optionally serve over rice noodles or rice. 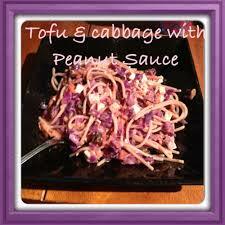 Use gluten-free soy sauce or tamari for a delicious gluten-free meal. One wonderful thing about this tangy, moist baked chicken dish is that it can be prepared the night before and then baked the next day. 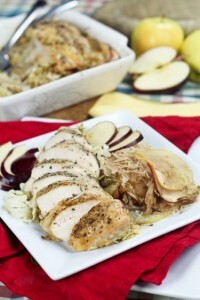 Regardless of the funny combination, this recipe for apple and cabbage baked chicken is sure not to disappoint. It uses Savoy cabbage, onions and apples as a topping for the baked chicken. You can definitely use the apple variety of your choice – there are so many kinds! This recipe uses red delicious and golden delicious apples. 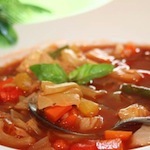 Additionally, apple cider vinegar and apple juice both add sweetness and tanginess, making the chicken moist and juicy.